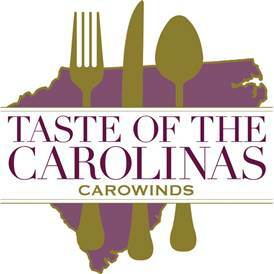 Charlotte, N.C.–Celebrate all that’s worth savoring at the third annual Taste of the Carolinas festival at Carowinds. Guests can discover some of the finest Carolina-inspired cuisine as dishes come to life right before their very eyes. On Saturdays and Sundays from April 22 through May 14, we’re bringing together all things Carolina from seven different regions: North Carolina’s Asheville/Mountain region, the Outer Banks and Lexington; Upstate South Carolina, the South Carolina Barbecue region, Lowcountry and Charleston. There are some new dishes for foodies to experience like Frog Legs, Smoked Egg and Pork Belly Salad and Bourbon Chocolate Fritters. Plus, we’re bringing back some guest favorites including our famous Crispy Shrimp and Grits, Mushroom Ravioli with Wild Herb Butter and Barbecue Ribs! A host of celebrity chef demonstrations will be held in Carowinds’ Harmony Hall. Damaris Phillips, the host of FOOD NETWORK’s Southern at Heart, will sizzle the crowd the first weekend (April 22) of our festival. And one of Charlotte’s favorites, Chef Alyssa, who also competed on FOOD NETWORK's Beat Bobby Flay, will show off her cooking skills April 30 and May 6-7. Chef Alyssa recently launched a product line of sandwich spreads and dips that are sold in retail locations: Smoked Chili and Rosemary Mustard and Champagne Tomato Jam. While the event celebrates mouth-watering Carolina favorites, Taste of the Carolinas is not just for food lovers. NEW for 2017! Born on the shores of North Myrtle Beach, we bring you South Carolina’s official state dance—the Shag. Guests can conquer this easy-going dance as pros walk dancers through the steps. Also new this year, professional wood carvers transform a simple piece of wood into art. Back by popular demand—wine and beer tastings! Tickle your taste buds with some of the best grapes and suds from Carolina breweries and vineyards. Authentic Carolina cuisine, handcrafted beverages, homemade arts and crafts, musical performances and more at Carowinds’ Taste of the Carolinas. To view the complete menu by region, see a list of events, purchase tickets and more, visit carowinds.com. Please Note: Food and beverages for Taste of the Carolinas are not included with park admission and are available for an extra fee. Guests must be 21 years of age or older to purchase or consume alcoholic beverages. To download Taste of the Carolinas assets, click here: Taste of the Carolinas 2017. For more information, please contact Carowinds’ Public Relations Manager Laresa Thompson at: laresa.thompson@carowinds.com. Carowinds is owned and operated by Cedar Fair Entertainment Company, a publicly traded partnership that is listed for trading on The New York Stock Exchange under the symbol “FUN.” In addition to Carowinds, Cedar Fair owns and operates ten other amusement parks, two water parks, one indoor water park, and five hotels. Cedar Fair also operates the Gilroy Gardens Family Theme Park in California under a management contract.